Roulette has a kind of mysterious, elegant, James Bond like vibe to it. Think a smoky classic casino, men in tux and women in long, glittery gowns scattered around the Roulette table. The game is still very popular in land-based and online casinos worldwide, also because its rules are fairly straightforward. However, online Roulette could possibly offer a surprising level of depth for the more serious gamblers. Before “putting it all on red”, you should learn the basics of this exciting game by reading our instructions below. Roulette is French for little wheel. And the first thing you’ll notice when you start to learn how to play Roulette online is of course this Roulette wheel. On the American Roulette wheel you will find 38 numbers, including 1 through 36, a single zero, and a double zero. However, if you’re playing the European version of Roulette online, the wheel only has 37 numbers as there is no double zero. You’ll also notice that the numbers are not listed consecutively. Instead, they’re out of sequence, but they do alternate from black to red, with the exception of the single and double zeroes, which are both green. The Roulette wheel spins in one direction whilst the ball spins in the opposite direction. These details might not seem important when playing online, but it’s still good to know some of the details of the game. 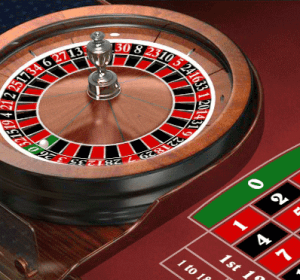 As you start to learn how to play Roulette online, you’ll also notice that the actual wheel may be completely stationary when you start up the game (this depends on the casino). It will spin after you’ve locked in your bets. But before you can do that, you need to know how the Roulette Board works. Note: Most online casinos will offer both types of online Roulette games and sometimes you will find even more versions available for you to give a try. The Roulette board is where you place your bets, and you should review the board thoroughly if you want to learn how to play the game the right way. Remember those numbers on the Roulette wheel? They’re replicated on the board. But instead of being out of sequence, they’re actually in consecutive order, from left to right, separated into three columns. In Roulette online, you have to guess the number or type of pocket on which the little ball is eventually going to land. To do this, there are a whole lot of bets you could make. “Inside” bets, or bets placed on specific numbers, generally have higher paying odds. To bet on a number, just “drop” your chips directly on the number. But before you drop all your chips on one number, it’s important to learn how to play Roulette by making other bets. Instead of just betting on one specific number, you can bet on the first dozen, the second dozen, or the third dozen. You can also bet on any of the three columns, the first 18 numbers, or the second 18 numbers. Other bets you should know about if you want to learn how to play Roulette online, include the street bet (betting on three numbers in a row, starting with the left column number), the corner bet (betting on four numbers), the split bet (betting on two numbers) and the line bet (betting on six numbers). When you want to bet on the outside bets, use the red, black, even, odd, high or low pockets.